When newly weds Jessica and Matthew find out she is pregnant, it’s unexpected but not unwelcome news. They had planned on waiting a while until they had children – they’re only in their early 20’s – but it isn’t like they didn’t want them and, with good jobs and a nice home, a baby feels like a perfect addition to their pretty perfect life. Unfortunately, once their little girl is born, things are not as perfect as they had hoped as Jessica struggles to come to terms with motherhood and those around her struggle to understand just what is happening. A Mother’s Story opens with Jessica being admitted to hospital, where she is treated with a mix of kindness and complete disrespect and disdain by the nurses, before returning to her wedding day and telling the story of her and Matthew’s courtship and the early days of their marriage through to her admittance. Each chapter gives a snapshot of their lives before ending with a diary entry, written by Jessica and set in the present. It paints a much darker picture of her life than the chapters would suggest. And it shows just how deep a depression she is in as she is diagnosed with and tries to recover from post natal depression. This isn’t something I have experience of myself and I don’t know anyone directly who has but I work in the mental health field and I know it is not only common but can be debilitating at a time when women are supposed to be at their happiest. 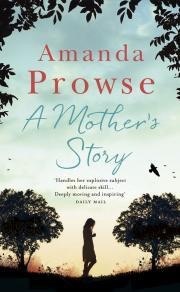 I think Amanda Prowse does a really good job of presenting the condition sympathetically and explaining it without being overly factual in a work of fiction. I did feel for Jessica, although as a couple, she and Matthew are quite sickeningly happy and possibly a little too perfect for me. I think, though, that part of the idea of this was to show that post natal depression can happen to anyone and it can be completely life changing and out of a person’s control. Even with this, I did enjoy it, though not as much as the first (and only other) Amanda Prowse novel I’ve read – What Have I Done. This might be because I listened to vs. read the book and found the narration a little off-putting at times – it was done by Prowse herself and her voice just didn’t seem to fit for me or have enough range when the different characters were speaking. I stopped more than once for a few days before continuing because I did want to know how it ended. Which mean that, overall, I would have to say I liked vs. loved this book. Still, worth a read (vs. listen! ).